What had happened to the shopkeeper? Why didn’t Li want to ask him about it? Hi Li. Hey, it looks like you've been really busy. Make a cake? Oh good. So how was Mr Brown, the shopkeeper? Hasn't he just split up with his wife? He has. It was tricky in the shop. I didn't want to say anything to him just in case I mentioned his wife. I only said: "Good morning" and he said: "Is it?" Or, I didn’t like her much anyway. Really? Anyway let me help you with your shopping… here you go… oops (Rob drops the eggs!). Rob! You have dropped all the eggs on my kitchen floor. Oh no! 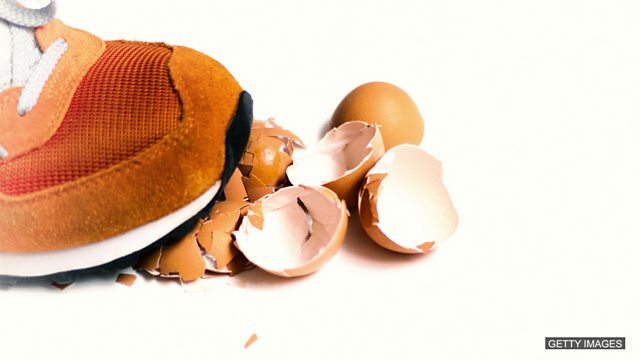 Now you really will be walking on eggshells! Well, I didn't like your cakes much anyway. ውይ፥ ሮብ የሊ ማዕዽ ቤት ውስጥ እንቁላሎቹን ጥሎ ወለሉን ሞላው። አሁን የዕውነትም በዕንቁላል ቅርፊት ላይ መራመድ ሊኖርባቸው ነው። ነገር ግን ያስታውሱ፥ በዕንቁላልቅ ቅርፊት ላይ መረማመድ ማለት ቃላትና ድርጊታችሁ ሌሎች ሰዎችን እንዳያስቀይሙ ከፍተኛ ጥንቃቄ ማድረግ ማለት ነው፤ በተለይም ደግሞ ክፉኛ የሚረብሿቸው ሁኔታዎች በሚኖሩባቸው ወቅቶች። በእንቁላል ቅርፊት ላይ የመራመድን ያህል ቃላታችሁን እና ድርጊታችሁን በጥንቃቄ ያከናወናችሁበትን ጊዜ ታስታውሳላችሁ? ለተጨማሪ English Expressions እንግሊዝና አገላለፆች በሚቀጥለው ክፍል ይጠብቁን። See you next time! • The shopkeeper’s wife has left him. • She didn’t want to upset the shopkeeper. ‘Treading on eggshells’, uses the verb ‘tread’. In this episode the verb is being used in two ways. Verbs can be used like nouns by adding -ing. This is called a gerund. That’s what treading on eggshells means. Treading on eggshells can be awkward. Verbs can take the continuous aspect by adding -ing. This is used in tenses such as the present continuous, or the present perfect continuous. I'm treading on eggshells around my boss at the moment, as I made a big mistake recently. I feel like I have been treading on eggshells. The continuous aspect is used for an activity in progress, rather than a completed action. Which is the correct definition of 'treading on eggshells'? የትኛው አረፍተነገር ይበልጥ ስለስሜት ይናገራል? Can you remember a time when you had to ‘tread on eggshells’? What did you have to do? What happened? Come and tell us on our Facebook group.